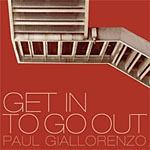 Pianist Paul Giallorenzo locates the jazz he makes with his quintet somewhere in the early 1960s, when post-bop was getting ready to explode into free jazz and its pioneers were rooted in swing, but thinking outward thoughts. Eric Dolphy's Out To Lunch (Blue Note, 1964), Ornette Coleman's Tomorrow Is The Question (Contemporary, 1959), and Andrew Hill's Point Of Departure(Blue Note, 1964) come to mind. Even the sound on Get In To Get Out hints at a Blue Note session, with its large room echoey sounds and warm groove. New York native Giallorenzo practices his craft in Chicago, the cliché-free home of arguably the most creative jazz scene in the country. He's assembled a stellar cast of saxophonist Dave Rempis (Vandermark 5, The Engines, Rempis Percussion Quartet), cornetist Josh Berman (Chicago Luzern Exchange, Last Distractions, Lucky 7's), bassist Anton Hatwich and drummer Frank Rosaly, the latter two members of Keefe Jackson's and Rempis' bands. 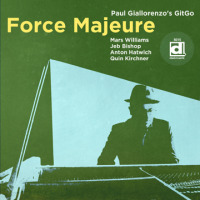 Get In To Get Out opens with the halting sounds of "Vacillation," with Giallorenzo's piano stuttering not unlike Thelonious Monk's infamous prodding; Rempis, playing more tenor than alto here, follows suit with his stilted jabs of sound. The song then pausessoon to return with the pianist rolling notes à la Cecil Taylor. "Twisted Lopes" finds Rempis back with alto in hand, conjuring the turbulence reminiscent of Dolphy. Elsewhere, a meeting of Bill Evans' piano and Charles Mingus' band is summoned on "Steamin In Cleveland," a swinging piece of bebop in which Berman turns his solo into a slow sermon and the pianist's notes into a ballerina dance. Rempis and Rosaly trade energy on "Double Team," the saxophonist playing his signature sound of upper register navigation against the industrial-strength brawny drummer. This music, while familiar, is not a parody of the dawning of The New Thing. Giallorenzo's compositions mix a complexity among the methodology of the music. He might start in 1961, but his Chicago sound surfaces within the circle of visionary bands that include Herculaneum, Harris Eisenstadt, Jason Roebke, and the Vandermark Five.